Orchard Core gets a huge configuration change to move closer to the Beta 3 release! Check out our post for the latest news around Orchard Core and Lombiq! We always happy if we find a new developer who wrote a post about Orchard Core. 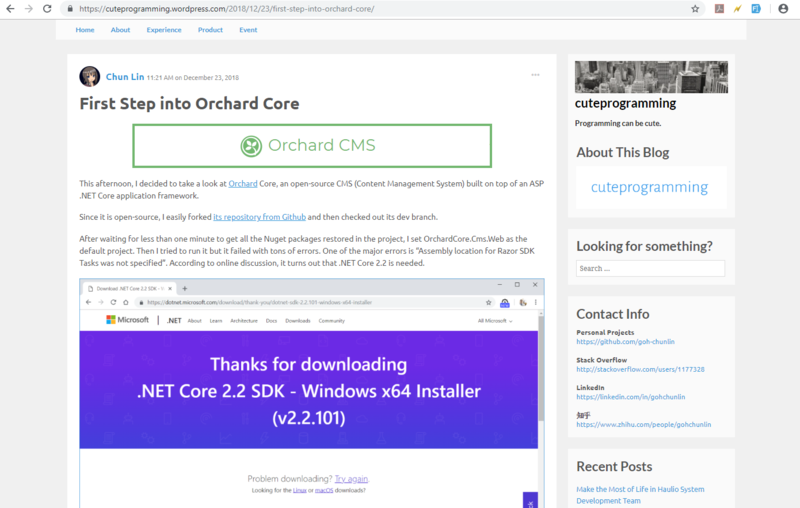 Chun Lin has a blog, called cuteprogramming and the end of last year he installed Orchard Core. Thanks to this PR, Orchard Core now supports custom configuration and it also removes YAML usage. We used to have YAML files for site settings, now it's JSON documents and it's the format of appsettings.json, like a standard .NET Core settings file. 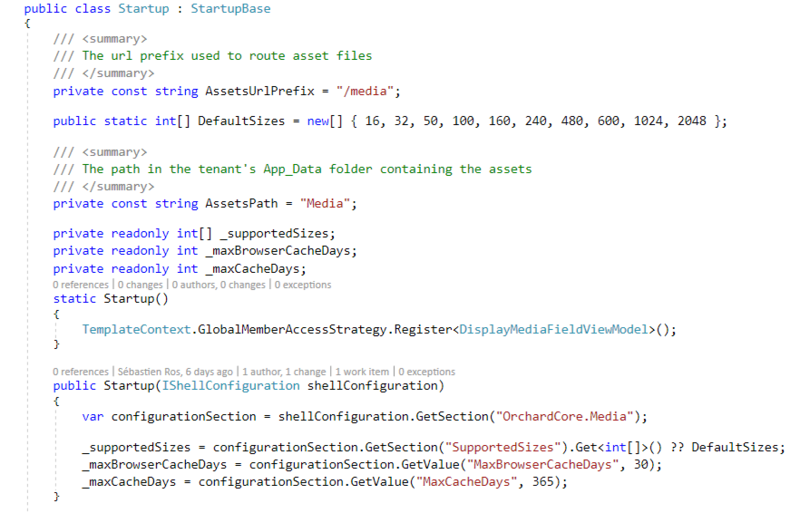 There is also a bunch of examples in the default appsettings.json file in the root of the OrchardCore.Cms.Web folder. The important thing to know is that everything which is specific to Orchard Core modules have to go in the OrchardCore section and then it's free to use any subsection inside that you want, so you could use a subsection based on each module (if you want) and decide what to put in there. There is no documentation for it for now, but it will come and we already mentioned these configuration changes 3 weeks ago in This week in Orchard. The Media module provides a good sample about how to use the configuration using appsettings.json and there is a Readme.md file to show this feature. Some of the hardcoded values and settings here are moved inside the appsettings. Check the Startup.cs file of this module. There is a DefaultSizes variable, that defines the list of the allowed values that you can pass in the width and height parameters of the URL of an image. If you try to resize an image to a size which is not part of this list, then it won't resize it. That's to prevent DDoS attacking websites by generating as many images as the user would. In the constructor, we are injecting the IShellConfiguration for the current tenant to get the section OrchardCore.Media and look for a section name called SupportedSizes and bind it to an array of integers. If it's not defined, we use the default ones. We do the same with the MaxBrowserCacheDays and MaxCacheDays values. If you're a user of Atlassian's chat service, HipChat, just like us, then you've surely heard that it'll be retired in February 2019. While Atlassian recommends and officially supports migrating to Slack what if you wanted to try Microsoft Teams instead? While there is no official support from Microsoft to migrate to Teams you can try our free and open source tool that we're released a month ago! Since the release we keep improving our utility and now have a v.0.3.0-beta release that means the app is now out of alpha. Note that this being a utility with just temporary use simplicity of implementation was favored against long-term maintainability. Note that the guide assumes you're using Windows but everything should work equally well under any OS supported by .NET Core. However, released executables are available only for Windows 64b currently. If you are interested in the app or the features it has, don't forget to read the Readme file in GitHub. On the previous meetings we showed our Visual Studio Extension and the Training Demo Module. 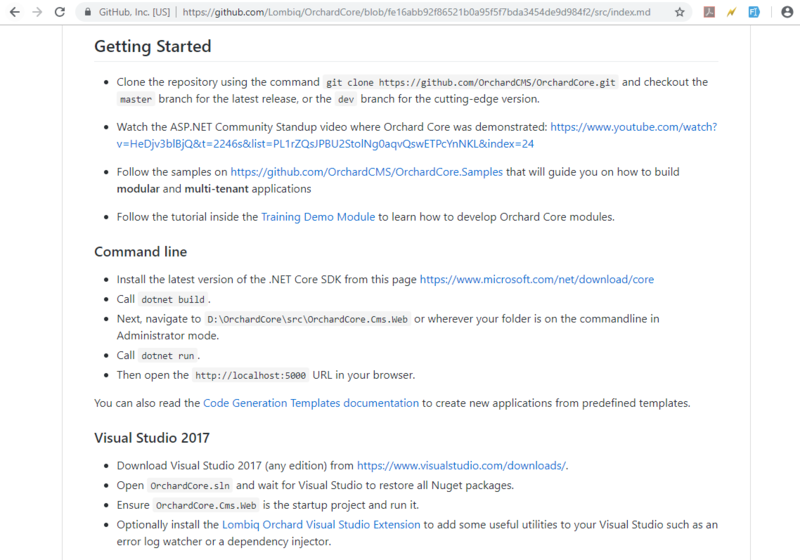 Now the Getting Started and the Visual Studio 2017 sections of Index.md file in the Orchard Core repository contains the references to inform the developers through the Orchard Core documentation too. We have started this newsletter to inform the community around Orchard with the latest news about the platform. By subscribing to this newsletter, you will get an e-mail every time when a new post published to Orchard Dojo, including This week in Orchard of course. Do you know of other Orchard enthusiast who you think would like to read our weekly articles? Tell them to subscribe here! If you are interested in more news around Orchard, don't forget to check out the recording of this week's Orchard meeting!